Made with alligator tenderloin, our Alligator Jerky is a unique and healthy treat. Compared to other meats, alligator meat is low in fat, low in calories and big on protein. Alligator is also low in saturated fat and high in monounsaturated fat. 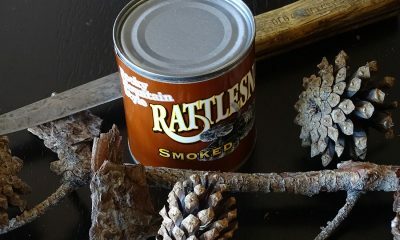 Flavored with a mild Cajun recipe and hickory-smoked, this is a delicious gator jerky your whole family will love to try. Unlike other alligator jerky’s, this is not a sausage-like product. It’s 100% solid strips of alligator meat…no chopping, forming or grinding here. Never treated with growth hormones or steroids. Preservative-free with no MSG, nitrates, or other fillers. 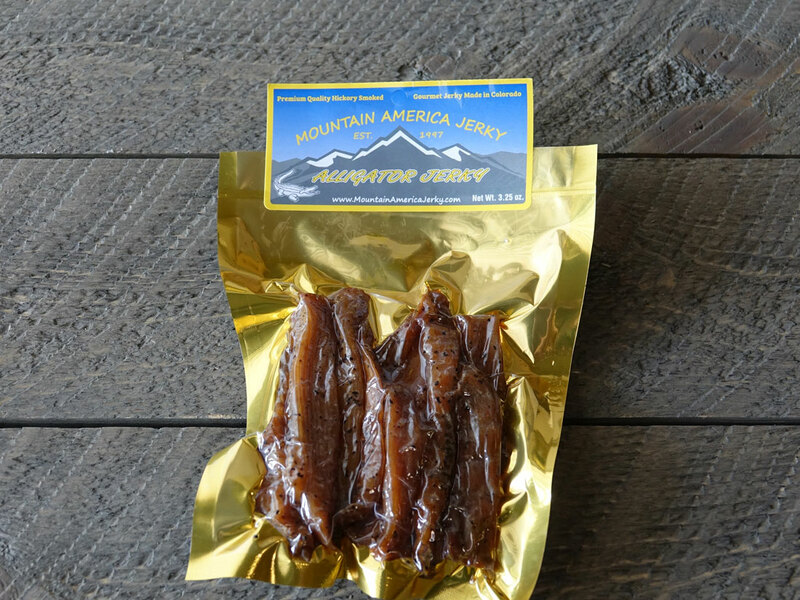 If you haven’t tried our Original Alligator Jerky yet, you’re in for a pleasant surprise. Ordered this for my hubby while he is on a military base since he wasn’t able to come home for Thanksgiving and he loved them. Thanks so much! I had ordered this along with some antelope. The alligator is absolutely amazing. Meaty and flavorful. It’s so good. Just as good if not better than other alligator jerkies out there. Already a fan of gator…but this is excellent!! Even my finicky senior cat likes it!! I’ll be buying more….. Very fast delivery. Excellent product. 10/10 would recommend, and purchase again. Absolutely fantastic. This jerky beat my expectations by far. Wonderful selection in the exoctic game meats. Would definitely recommend. Bought this (in the Exotic Jerky Sampler, 6-pack) as a Christmas present for my brother and he absolutely loved it! Quick delivery and price is decent for the quality of jerky. 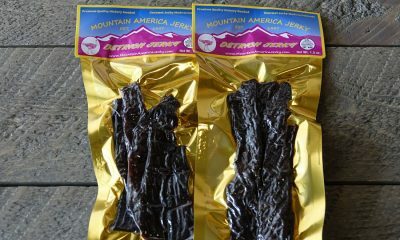 I liked the fact that this is pure kangaroo/yak etc.. jerky, and not jerky with beef fillers like most pro sport shops advertise. Would definitely order from you guys again! Thanks so much!! Tried it for the first time and loved it. Even better than Turkey. (Alligator review) Love it….haven’t been disappointed yet with any variety. Love the Alligator and Wild Boar jerky the best. Best jerky buy in the U.S. This jerky is amazing. I enjoyed eating it and so did my girlfriend. I will definitely be ordering more jerky in the future. (Original Alligator review) Love their Jerky, will be putting in another order tomorrow!! (Original Alligator review) My girlfriend got me alligator jerky and venison love it can’t wait to get some more …….! The best jerky I’ve ever had, I’ll order again. Ordered the Alligator Jerky and received it within two days! Shipping speed was excellent and the alligator jerky was awesome! My coworkers and I shared a package and we will definitely be ordering more products! Everyone loved it!!! 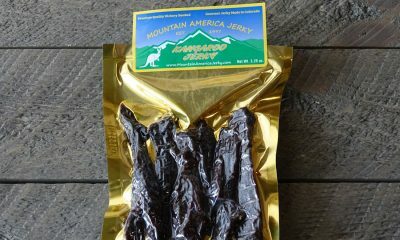 Armadillo Pepper reviews Mountain America’s Alligator Jerky. This wild game jerky is 100% real Alligator – no fillers. Interest in wild game jerky is growing due to its low fat and high protein. Alligator is also low in saturated fat and high in monounsaturated fat. 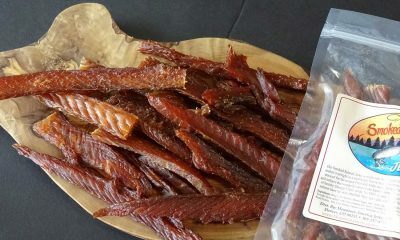 Alligator Jerky: Easily one of the most unique and exotic, the alligator jerky was also one of the best. More tender than most of the other types, the alligator jerky recipe is a simple soy sauce, brown sugar base. It’s a little on the sweet side with just enough salt and pepper to balance the flavor. 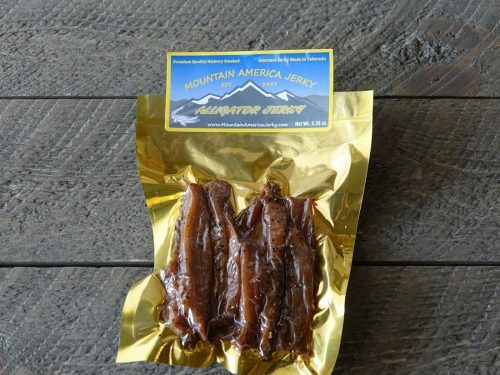 (Original Alligator review) I was debating on whether to use this site or some other ones I found, but after seeing this company’s BBB rating (Better Business Bureau), which is an A+ by the way, I decided to go with Mountain America and I must say that this is some of the best jerky I’ve ever had. Especially the teriyaki salmon! (Original Alligator review) I ordered 3 different jerkys. Original Ostrich Jerky, the Habañero Buffalo Jerky and the Alligator Jerky. I must say I loved all 3 very much but the Alligator Jerky was without a doubt the best tasting jerky I have ever tasted in my life, Mountain America Jerky has a new customer in me. Maybe next I will give the Kangaroo Jerky a try. (Original Alligator review) I never pass up jerky any chance I get and unfortunately I hadn’t had the pleasure of trying your jerky until now! I received an exotic sampler package for my birthday from Ostrich, Elk, Yak, Antelope, Kangaroo, to even Alligator–and I can guarantee that this is the best jerky I have ever had!! I have yet to go through all of my sampler, but have tried your Elk, Alligator, and Ostrich; the Alligator blew my taste-buds clear to heaven! Thank you for creating such amazing, all-natural, hand-made jerky! You now have a loyal customer and will buy from you whenever I get the chance!